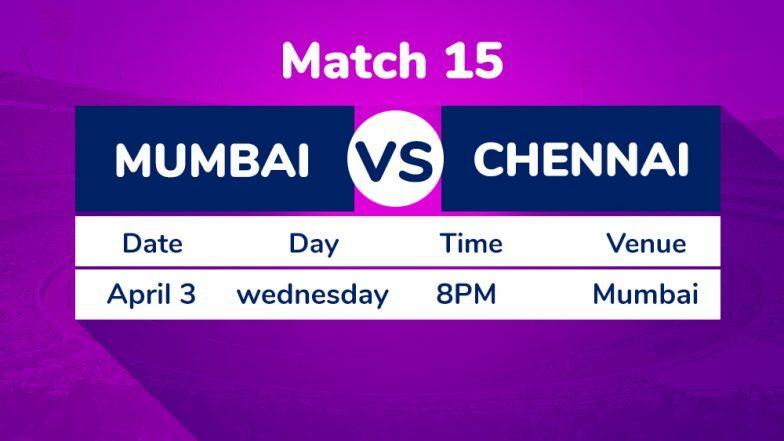 Mumbai, April 2: Chennai Super Kings (CSK) will start as favourites riding on skipper Mahendra Singh Dhoni's rich form when they take on slow-starters Mumbai Indians in a high-voltage Indian Premier League (IPL) clash here on Wednesday. Super Kings, who have won the cash-rich T20 league thrice like the hosts, are sitting pretty at the top of the eight-team table with three wins on the trot from three games. CSK Team in IPL 2019: Schedule and Squad Analysis of Chennai Super Kings in VIVO Indian Premier League 12. Placed seventh, Mumbai Indians, on the other hand, have not started well as usual with a victory sandwiched between two defeats. On the morrow, Super Kings will hold the edge with Dhoni in rollicking form. The 37-year old former India captain hit a 46-ball 75 in their last game against Rajasthan Royals to singlehandedly lift his team from 27/3 to 175/5 at home. Mumbai Indians Squad in IPL 2019: Team Profile, Schedule of MI in VIVO Indian Premier League 12. Chasing 176 for victory, Royals could not match up to Super Kings' death bowling and Dhoni's shrewd captaincy. Called the 'Daddy's Army' for a host of over the hill cricketers in their arsenal, Super Kings have defied all odds to win the title last season and have continued their form this year in the opening exchanges. The visitors have experience in their batting and bowling departments with the likes of Shane Watson, Suresh Raina, Kedar Jadhav and Ambati Rayudu adding to the might. Rayudu, who is still hopeful of retaining his No. 4 spot in the Indian team for the World Cup, has been off colour and has to get his act together quickly. Deepak Chahar was useful with the ball the other day and would look to continue the good work. Coming to the hosts, Mumbai are over-dependent on openers Rohit and South African Quinton de Kock. The others have failed to get runs and need to step up. On Wednesday, Mumbai will have the services of a new recruit, West Indian fast bowler Alzarri Joseph, and can also play all-rounder Ben Cutting in place of the Lasith Malinga who has looked lacklustre. In the spin department, Chennai have the edge too, with South African Imran Tahir and Ravindra Jadeja doing the job well after the power play. Squads: Mumbai Indians: Rohit Sharma (capt), Jasprit Bumrah, Hardik Pandya, Krunal Pandya, Yuvraj Singh, Kieron Pollard, Lasith Malinga, Rahul Chahar, Ben Cutting, Pankaj Jaiswal, Ishan Kishan, Siddhesh Lad, Evin Lewis, Mayank Markande, Mitchell McClenaghan, Alzarri Joseph, Jason Behrendorff, Anukul Roy, Rasikh Salam, Anmolpreet Singh, Barinder Sran, Aditya Tare, Suryakumar Yadav, Jayant Yadav, Quinton de Kock. Chennai Super Kings: M.S. Dhoni (captain & wk), Suresh Raina, Ambati Rayudu, Shane Watson, Faf du Plessis, Murali Vijay, Kedar Jadhav, Sam Billings, Ravindra Jadeja, Dhruv Shorey, Chaitanya Bishnoi, Rituraj Gaikwad, Dwayne Bravo, Karn Sharma, Imran Tahir, Harbhajan Singh, Mitchell Santner, Shardul Thakur, Mohit Sharma, K.M. Asif, Deepak Chahar, N. Jagadeesan (wk), Scott Kuggeleign.